Location, location, location! 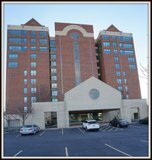 Here's your opportunity to own a fabulous 2 bedroom, 2 updated bath high rise condo near the waterfront! Hardwood floors, granite counter tops, all freshly painted, great open floor plan with sliding glass doors that exit to the beautiful rooftop patio and courtyard. Underground parking, private storage area, gym with sauna, community lounge in front foyer, security entrance, inside mailbox and on-site building maintenance. A short walk to downtown, marina, canal side and year round events! Pet friendly building too!